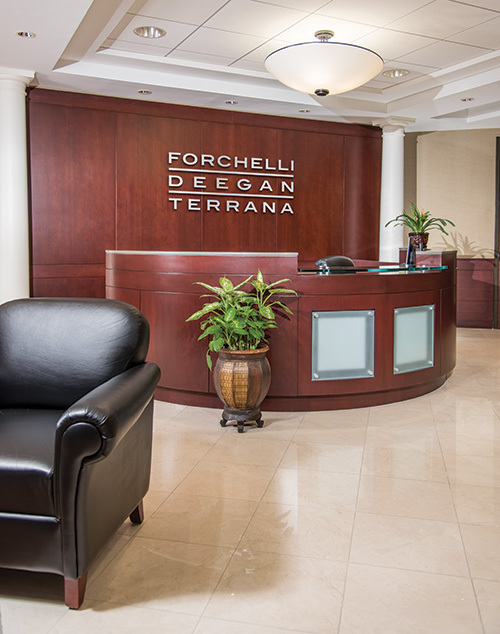 Founded in 1976, Forchelli Deegan Terrana LLP is one of Long Island’s largest and most distinguished law firms. The Firm represents a broad range of clients, including national, regional and local businesses, public, private and family-owned companies, major real estate developers, property owners and operators, contractors, banks, municipalities, educational institutions, not-for-profits, foundations, and individuals. Personal attention and quality representation that is both practical and cost-effective are hallmarks of the Firm. With over 60 attorneys, the Firm is able to provide expertise in nearly 20 different practice areas, with the talent, skill and experience necessary to meet the legal needs of virtually any client. These attorneys are supported by a dedicated team of paralegals, law clerks, administrative and support staff, and cutting-edge office and communications technology. Headquartered in Uniondale, NY, in one of Long Island’s premier office buildings, the Firm is conveniently located for clients in Nassau and Suffolk counties, as well as those in New York City.